According to January 2017 website survey, it was discovered that there are nearly 1,800,047,111 websites running over the globe. The websites of today are majorly built using content management system like Magento, WordPress, Joomla, Drupal, etc. The reason for selecting a CMS for creating any website is to overcome the problem of writing lengthy code. Instead of that, pre-written code(plugins) are managed in the panel to provide the required features. But while creating any website, social sharing buttons have always been a big hurdle for the developer to overwhelm. The developer needs to execute a complex code to insert the sharing buttons in your simple(HTML based) website. Apart from that, there are numerous plugins available in the market to fulfill your social sharing requirements in CMS based website. But you may not be satisfied with any of them (reason may be its non-impressive style or poor functionality). 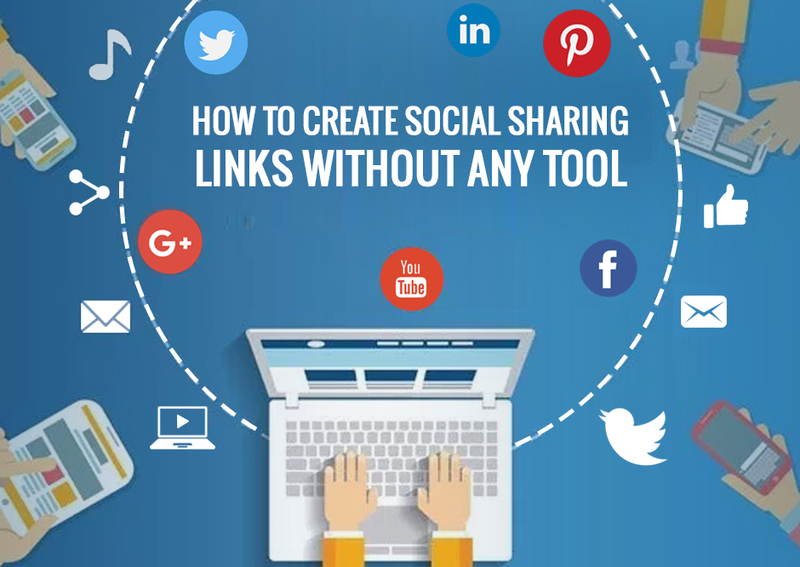 What if I tell you that you can create your own social sharing links manually without installing any plugin or using any tool. 1- Social media icons as per your taste and liking. 2- Keen interest to learn new things without any coding knowledge. 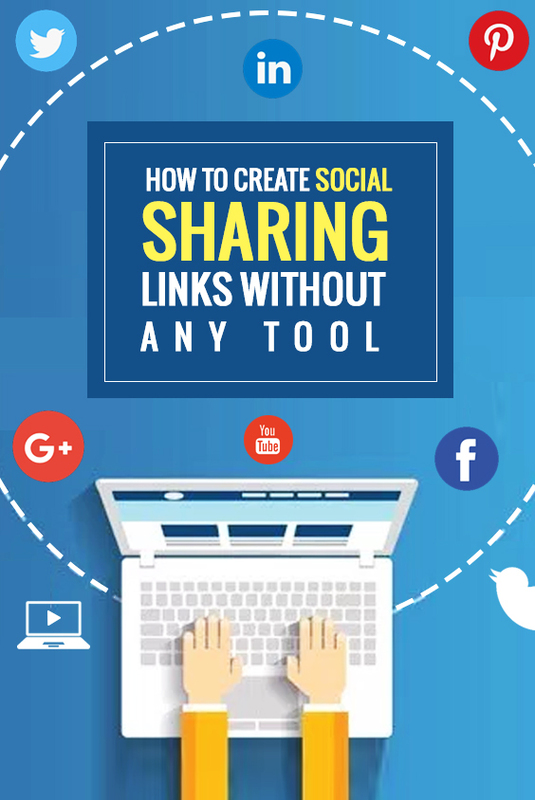 Following is the basic code that can be used for creating the social sharing links. You only need to replace the URL, TITLE, SOURCE, which will be discussed later in the blog. Also, Learn how to change your text formats in Facebook posts.. . isn’t it fun?? [URL]- Replace this with the URL you want to share on different social platforms. [TITLE]- Replace it with the title/text that needs to be shared with the URL. [SOURCE/DOMAIN]- In case you have used any other website as a source and you want to tell your viewers about it too, then replace it with your reference source. [MEDIA]- Replace it with the address of the image that is to be used in Pinterest. Case I- As soon as you replace the above-mentioned code, you will encounter space between words used in the Title tag. As a hyperlink don’t allow any space, it will create a problem for you. So, to resolve the issue of space between words, you need to use “%20” or “+” which symbolizes one space between two words. both will give the same result. Case II- While creating the links, you might also experience that slash “/” in the [URL] is replaced with “%2F“. So, don’t bother about it. You can use any of the two formats to create the executable links. both these URL will be implemented in the same manner. Case III- While writing the URL, you can also use “%2D ” in place of “-“. You don’t need to get confused in between these two codes. both these URL will give the same result. Case IV- You will also find that while writing the URL, in place of the colon “:”, “%3A” is used. Both these codes represents same while creating the links. Now, lets try out one live example that will illustrate you the use in a better way. In case you are implementing this in a simple HTML based website, then you need to use the above code as it is. There you only need to change the href link and image path (image link address). But if you are running a CMS based website, then you don’t need to take any headache to using the complete code. Instead, you only need to hyperlink the image social sharing icon with the link mentioned in href. As of now, you are all set to create your own social sharing buttons manually. But to enhance its functionality, you need to use two attributes within the above mentioned steps. 1- Use title=”Share on Facebook” in anchor tag. It will allow the user to see what your icon is made to do, when you hover the mouse pointer over the image. 2- Use target=”_blank” within anchor text. This attribute will automatically open a new tab as soon as a visitor clicks on one of the sharing link. It will allow the user to share your post without hampering it. So, from now on-wards, you don’t need to hire any web developer to fulfill your requirements regarding social sharing options. You can create your own social buttons without any programming knowledge as well as any pre-build plugin or tool. If you need to know about more social share buttons then, feel free to comment your requirement in the comment box below.